The Ireland defender is already looking forward to facing Germany in Dublin next month. JOHN O’SHEA LEAVES the Ireland camp with a sense of satisfaction after picking up the maximum points on offer from this international week. It may not have been against two footballing heavyweights, but two wins have seen Ireland leapfrog Scotland and put four points between them ahead of next month’s penultimate round of qualifiers. The experienced defender is well aware that the performances will need to improve significantly if they are to get anything out of Group D’s top two teams, but he is relishing the prospect of facing the world champions on 8 October. “We want to be better,” O’Shea said. “We got two clean sheets but we would have been disappointed if we hadn’t against these two teams and we know we’re going to get bigger tests against Germany and Poland. It was a terrific run by Jeff Hendrick which led to Jon Walters’ 69th-minute winner and O’Shea, who famously nutmegged Real Madrid star Luis Figo during his Manchester United days, suggested that he was the inspiration behind the piece of brilliance. 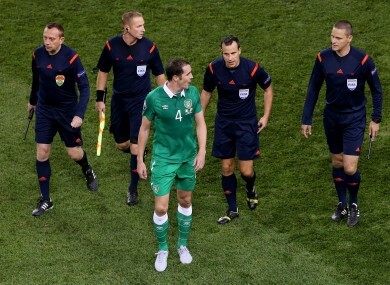 I think he must have been watching videos of me from a few years ago!” O’Shea joked. “Jeff’s got that ability, you see the type of goals he gets for Derby. He can ghost past players and he has big power and strength but you saw the delicate touches too. Team-mate Seamus Coleman was equalling as pleased with the result. “It’s been a great week,” said Coleman. “You know how tight the group is and it has just turned around in our favour. Scotland didn’t have the best week and we had a great one so we’re delighted with it. Email “'He must have been watching videos of me from years ago!' - O'Shea on Hendrick's match-winning run”. Feedback on “'He must have been watching videos of me from years ago!' - O'Shea on Hendrick's match-winning run”.